When I was in college, a friend of mine gave me a copy of The Mists of Avalon for Christmas. I LOVED it, but I hated the author’s portrayal of Guinevere as meek and well, boring. That made me seek out other books about Guinevere and I read Parke Godwin’s Beloved Exile, which tells the story of what happened to Guinevere after the fall of Camelot. That made me wonder what happened to her before and after Arthur, which is something you don’t hear much about. Then Guinevere came into my head, telling me she wanted me to write her story (which I thought at the time would be all one book). The rest, as they say, is history. 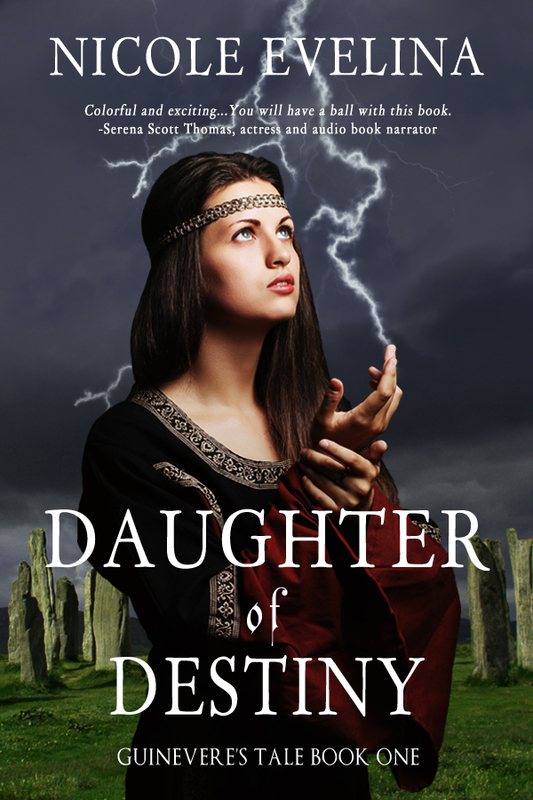 How long did it take you to write Daughter of Destiny? All told, about 15 years. I started it in September of 1999 while I was in college. It was a hobby, something I did when I got bored. I had no plans of publication. Then in 2008 when I read Twilight (go ahead and laugh), I thought “hey, if she can do it, so can I” and I started taking my writing much more seriously. I think I finished the first draft in December 2009. After that there was a lot of editing and some significant re-writing. That was when I realized it was long enough to be the first of three books and I started researching the publishing industry. I had an agent for two years and this book went to acquisitions three times, but with no offer. Then when my agent and I parted ways and I decided to go indie, I knew it would be the first book I’d publish. Guinevere is interesting. On one hand, she’s intelligent, independent and driven, but she can also be very naive and judgmental. I share all of those traits with her, plus her tenacity. Neither of us will let go of something we want until we get it or are forced to give up, but only if there is no other alternative. I think we are different in that she is very duty-driven and that’s not really part of my life. I have to go to work, pay my bills and obey the law, of course, but I don’t have that sense of expectation dogging my every move. I actually really admire her for ability to submit when she needs to. As far as other characters, Isolde is a bit of wish fulfillment in that she’s the type of carefree woman I wish I was and Elaine’s darkness is partially based on me. Morgan and Father Marius have no relation to me, but they are the kind of evil characters I love to hate. And of course, Aggrivane is my fantasy man. Some of the character dynamics and relationships are based in real relationships. For example, I was able to draw upon my four years at an all-girls high school to create the bond of sisterhood among the girls and women of Avalon. Likewise, Guinevere’s close relationship with her mother is modeled on my own (but thankfully mine is still alive). The interplay between Lyonesse and Pellinor and Guinevere and Elaine are based in reality, but I won’t say who. Well, I mentioned Marion Zimmer Bradley above. I was fortunate to get to spend two weeks in England on an Arthurian Legend tour with Jamie George, one of the people who helped Ms. Bradley research her novel. Her epic style was certainly influential, as was that of Jacqueline Carey. I’ve been told I have a writing style reminiscent of Stephen King, which is weird because I’ve never read any of his books (other than the non-fiction, On Writing). I’ve also been compared to Elizabeth Chadwick and Susanna Kearsley by agents and editors. I am fascinated by religion and spirituality, especially the mystical side. I think that comes through clearly in this book and likely will in everything I write. I have a strong background in Catholic and Wiccan/neo-pagan studies (especially the mystical) due to years of personal research. My fascination with the Celts came from a 1993 TV show that almost no one saw called Roar. The premise was about the conflict between an Irish community and the invading/ruling Romans. I quickly found out how historically inaccurate that was (the Romans never made it to Ireland), but the research bug had bitten me and I spent roughly the next 15 or so years absorbing everything I could about the historical and mythological Celts. What’s the strangest or most interesting thing you researched for this project? Oh gosh, there are a lot of things. You know how they say most authors’ search engine histories could get them locked up? Well, it’s true. For this book, I think the most interesting thing was trying to find out about the beliefs of the Druids, which is really hard because there’s not a lot of concrete evidence. The strangest thing was probably Celtic burial practices and their views on death and dying. Because I have to. I know that’s a clichéd answer, but it’s true. For me, writing is like breathing. I have these characters in my head who talk and demand their stories be told and I think if I didn’t write, I’d be crazy. I know when I don’t, I get cranky and irritable. Even if only my friends and family ever read my books, I’ll be happy because I’m doing what I was put on this earth to do. Ha! That’s like asking the ocean if it has water. I’ve got about 20 plots in my head. Right now two are at the forefront, the final book in the Guinevere’s Tale trilogy, and a historical fiction set in the mid-1800s (I don’t want to say anything more than that at the moment). Also, top of mind are telling Morgan’s side of the story (which will be best read after all three Guinevere books to avoid spoilers) and that of Tristan and Isolde (which Isolde demanded I do when she came into my head all those years ago). That one is actually partly started. Beyond those, I have stories ranging from early Roman Britain to Saxon and Tudor/Elizabethan England, 19th century France and WWII on the docket for the future. What made you decide to be an indie author? It was a combination of things, and a decision that I took a long time in coming to. One of the main factors was that it was time for me to get my work out there. It had been four and a half years – and six books – since I started querying agents. My work was just stacking up with no place to go, even though I had people telling me through my blog and social media that they wanted to read it. I wanted to be able to learn from it, which I can’t do unless others can read it. That, combined with wanting to have Madame Presidentess published before the November 2016 Presidential election (which was by then impossible to do traditionally because of the time it takes to produce a book), and a desire to have more control over my career, led me to start my own publishing company. However, I am open the possibility of traditional publishing in the future. I haven’t ruled anything out. Who is part of your publishing team? I have a fabulous editor in Cassie Cox, who runs her own freelance company. She is constantly pushing me to dig deeper into the why behind what I write, which makes the books so much stronger. I use Jenny Quinlan of Historical Editorial as my cover and social media designer. I love working with her. She has great vision (pardon the pun) and can manage to summarize the entire book in single image. Liz and Morganna at The Editorial Department handle my interior layout, for which I am immensely grateful. Not only to they make the books look eloquent, they have a strong attention to detail and have save me from making mistakes on more than one occasion. And there’s also my audio book narrator, Serena Scott Thomas. She is signed on to record all three of the Guinevere books, and I hope she’ll be available for Morgan and Isolde’s stories in the future. She has an uncanny knack to breathe life into these characters exactly (if not better) than they sound in head. And she’s fun! Bonus Question: Why historical fantasy? Believe it or not, I originally set out to strip Arthurian legend of all of its magic and tell the historical story of Arthur and Guinevere. It didn’t take me long to realize that without some magic, the story loses some of its appeal, its life-spark, if you will. So I decided to take a studied approach to the magic my characters use. The Celts believed in magic as part of their everyday lives, so I was careful to make it subtler than you see in high fantasy stories. I also wanted it to reflect the Celts’ deep reverence for and connection to nature, so I chose to have my priestesses perform elemental magic. Between that and The Sight, which is also part of Celtic belief, I felt like I had enough fantasy to do that part of the story justice without making it so historically impossible as to overshadow that aspect of the story. Historical fantasy is a nice balance of two genres that I love.